To further my French studies, Natalie Holstein-Charron has lent me Alistair Horne’s Seven Ages of Paris. I truly admire the tenacity the Parisians display in executing each other from the time of Philippe Auguste in the twelfth century to the notorious Cardinal Richelieu in the sixteenth. And I haven’t yet reached the Revolution! 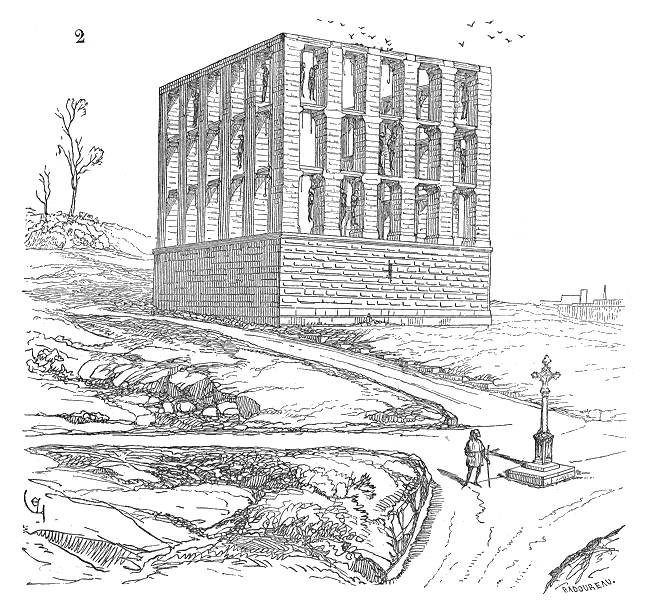 Here is a sketch of “le Gibet de Montfaucon” by Eugène Viollet-le-Duc in Dictionary of French Architecture from 11th to 16th Century (1856). So many windows, so many hanging bodies. Death constantly takes the stage in Paris, but food as well makes an appearance as on page thirty-two, where Horne highlights the creation of a marketplace in Paris.
. . . in the early part of the twelfth century Louis le Gros had set up a primitive market on some marshy fields, Les Champeaux, which became known in perpetuity as Les Halles. 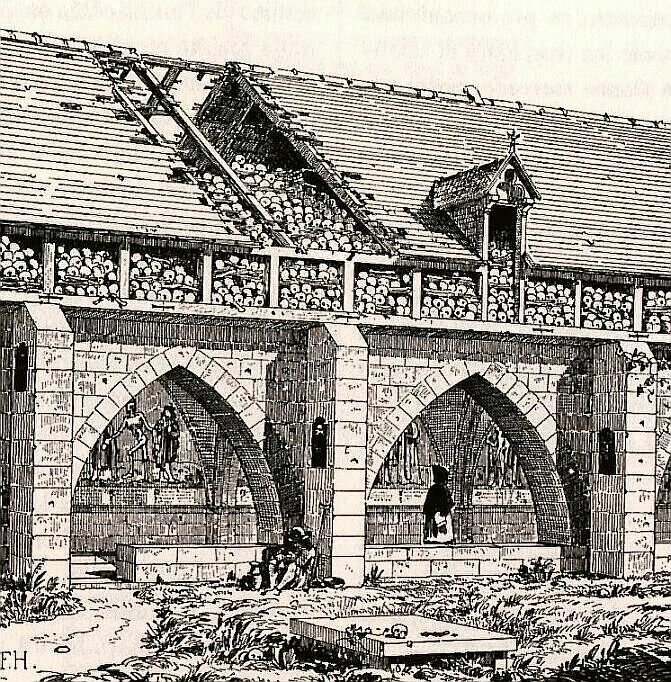 In 1183 Philippe Auguste had them replaced with two permanent stone buildings designed to protect both goods and vendors from bad weather and from robbery. 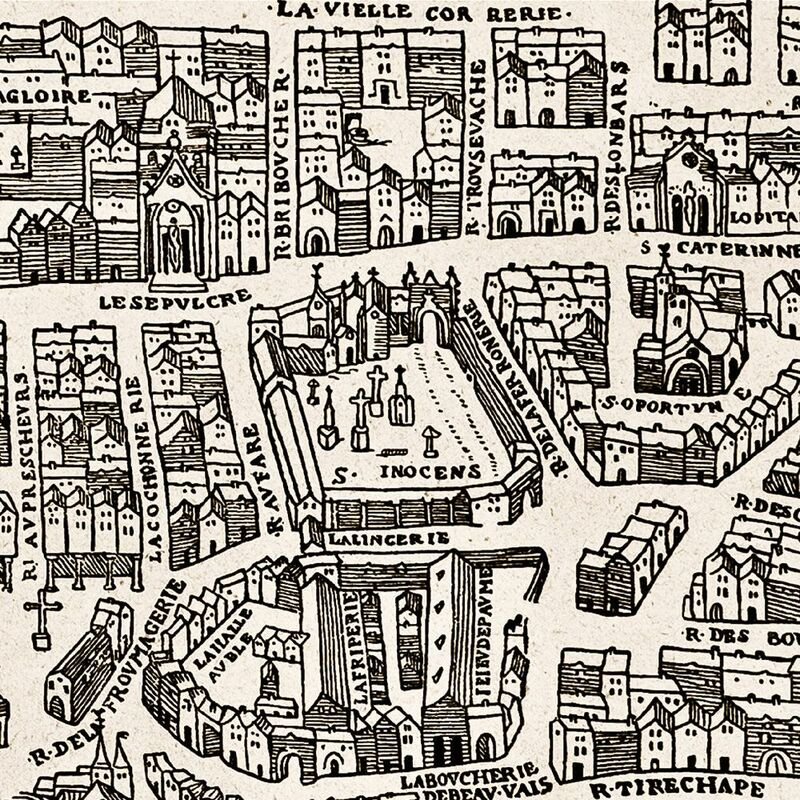 Here is a map from 1550 of Les Halle in Paris. Note the boucherie near a cemetery. 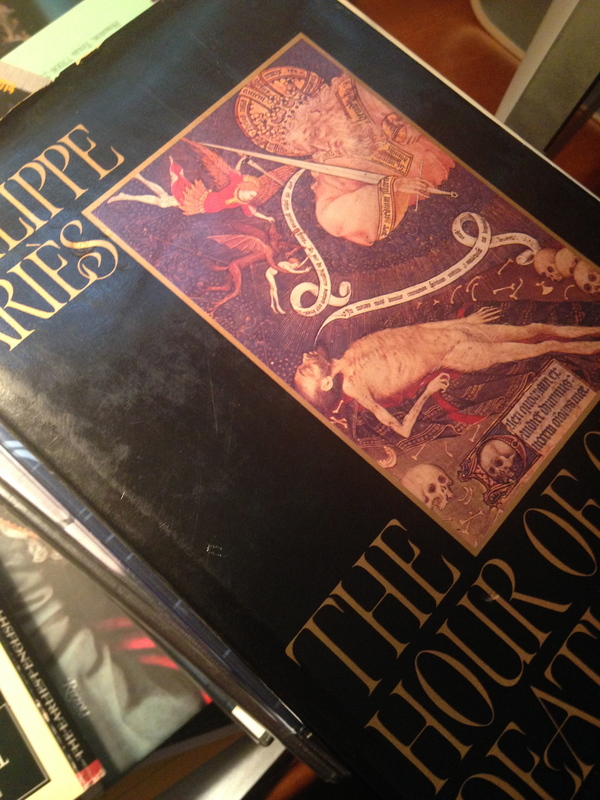 Since I discovered Philippe Ariès’ The Hour of Our Death at John K. King Used and Rare Books in Detroit back in the late eighties, I’ve treasured my copy as a touchstone on all things concerning death in the Western world. Now it will help me write about food. On page fifty-one, Ariès mentions les Champeaux. In Paris, les Champeaux is the very large cemetery of a very small parish church, the church of les Saints-Innocents. Bones and food right next to each other. Death leading to burial, death leading to sustenance. The close proximity of bones underground, bones in stock pots. Ariès continues. The dead were buried not only sub stillicidio but also in porticu: under porch roofs or galleries built onto the wall of the church, under niches or enfeux, carved out of this wall and succeeding one another like an arcade. Around the fourteenth century it became common procedure to dig up the more or less dried-out bones in the older graves in order to make room for new ones and to pile them in attics of the galleries or above the arches, if any. Here is an anonymous drawing of a charnier at the Holy Innocents’ Cemetery with a dance macabre. Ariès also offers this very nice etymological note. In Rabelais, as in Plautus, the word carnier refers to the pantry where the lard was kept. A word and its history bring together a room for pork fat and a sacred place for human bones to rest together. With all these connections appearing with seeming innocence, I was not surprised when I opened a gift from my daughter, My Last Supper, 50 Great Chefs and Their Final Meals. About to be executed for any number of crimes (including this photograph), Bourdain would choose to eat Roast bone marrow with parsley and caper salad as served at St. John Restaurant in London. Again, a connection of food and death, this time with the focus on the last food to pass one’s lips before one passes out of this life. 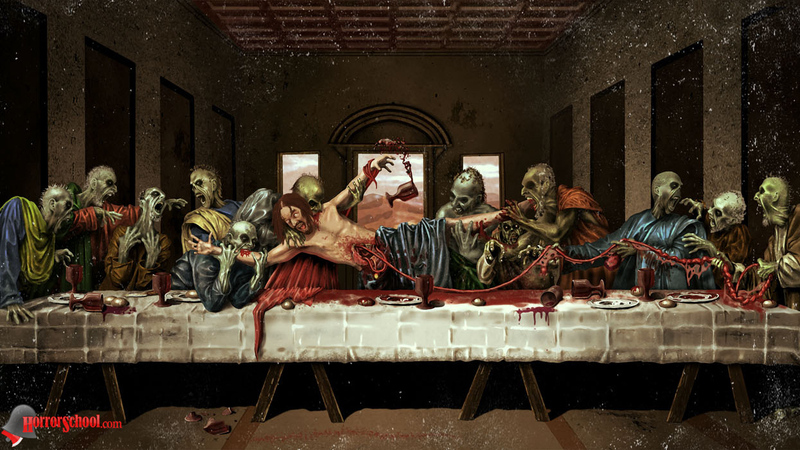 A touch of a sacrificial feast, and of course there have been a few famous ones. No, probably not the one you were thinking of. 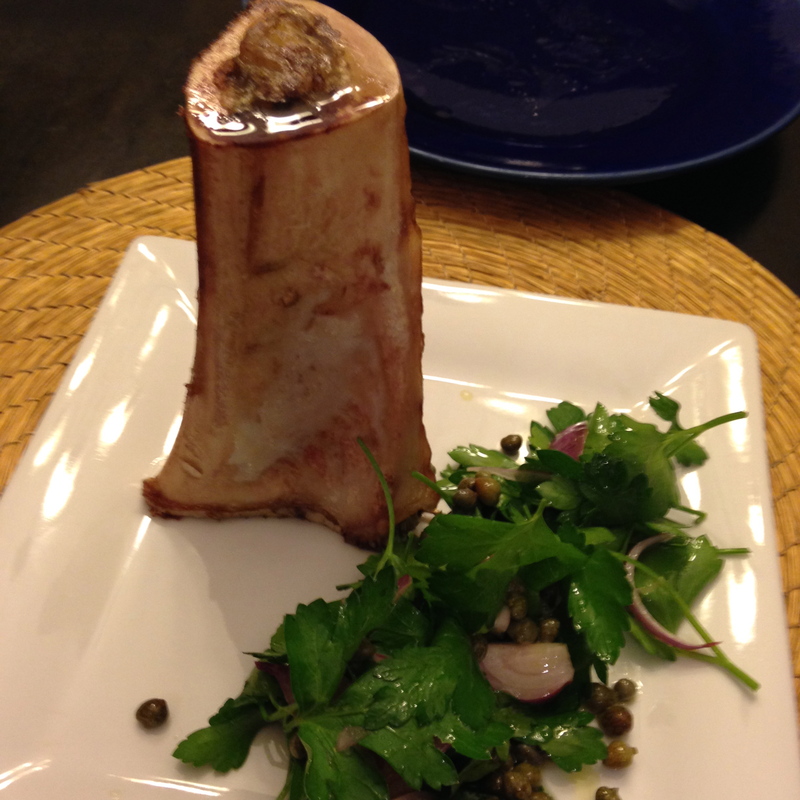 I’ve cooked and written about Henderson’s lovely Roasted Bone Marrow with Parsley Salad, and will do again, but this time with death in mind, that is, roasted bone marrow as a memento mori. 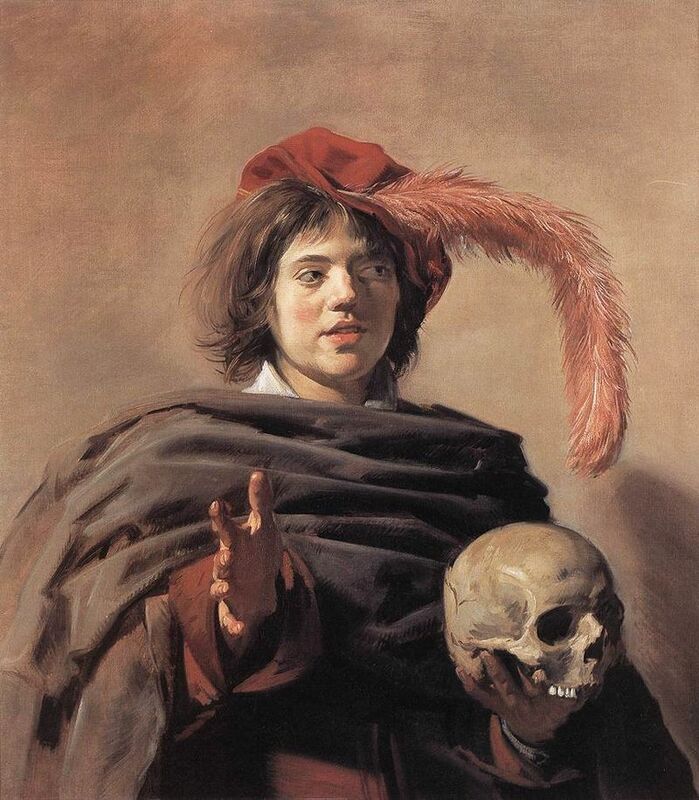 A memento mori may appear as a skull on a table with a violin, ink, flowers; as a fly on a bowl of fruit; a dance macabre; and as a young man carrying a skull in Frans Hals seventeenth-century painting. 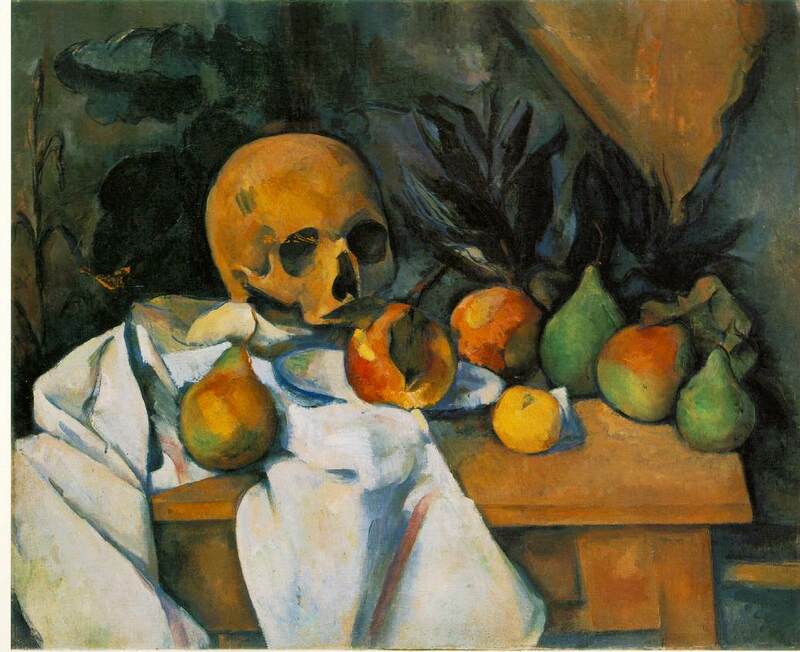 Consider the memento mori in Still Life with Skull by Paul Cézanne (1895-1900). The division between death and life blurs here as the skull carries a reddish-orange tone found amongst the fruit on the table. This colorful interplay presents death as food, a certainty which Robert Pogue Harrison in his The Dominion of the Dead points out is now lost on contemporary devourers of life. The word “holocausts” reverberates, something whole that is burnt, ascending as smoke. Think of Numbers 28.3-6. As a regular burnt offering every day, two yearling lambs without blemish. You shall offer one lamb in the morning, and the other lamb you shall offer at twilight. And as a meal offering, there shall be a tenth of an ephah of choice flour with a quarter of a him of beaten oil mixed in–the regular burnt offering instituted at Mount Sinai–an offering by fire of pleasing odor to the Lord. According to a 2013 report from the USDA 6.6 million cattle were commercially slaughtered in 2012. 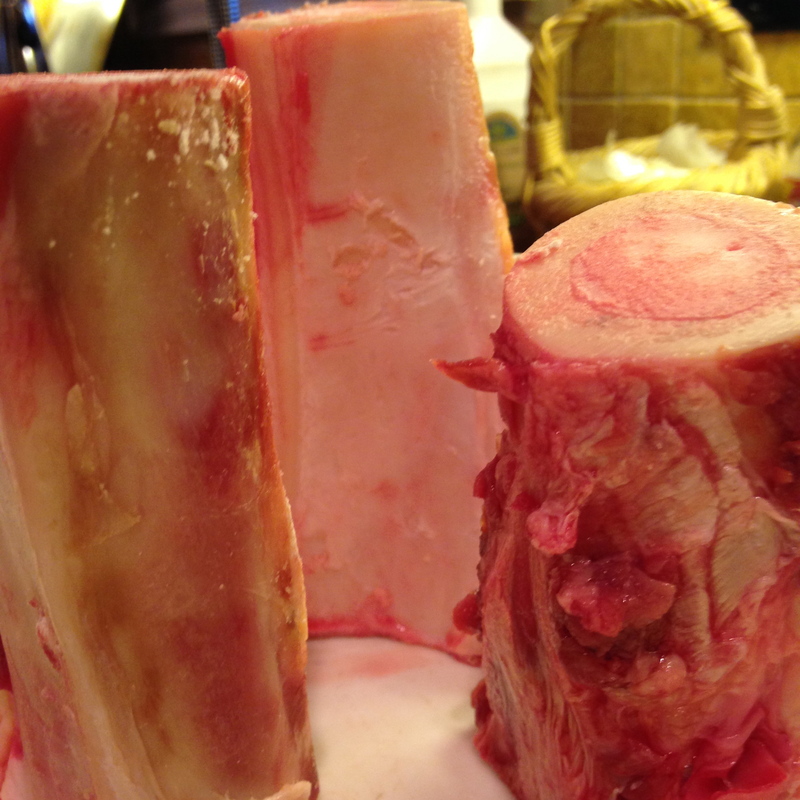 Any death deserves its sacred marker, so let me consecrate these Bison marrow bones with the above and following words. 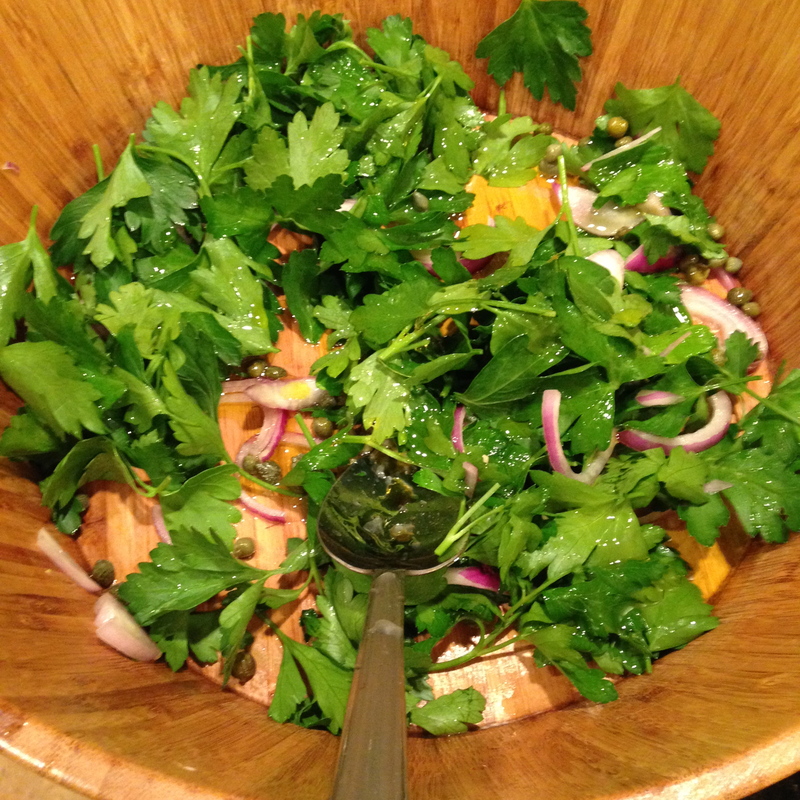 While waiting for the bones to darken, I make the parsley salad with parsley, shallots, capers and top with a dressing of lemon, olive oil, sea salt and pepper. The time has arrived. 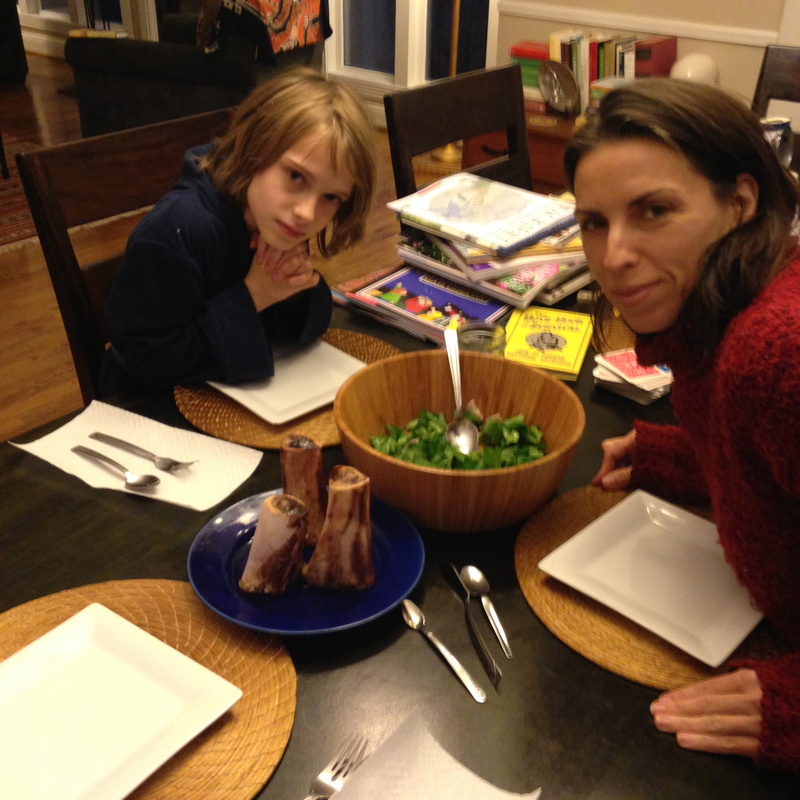 Gabriela and Demian join me at the table with the towers of now roasted bison bone, the salad, and of course, long spoons. My plate offers the scene. Fergus Henderson has toast with his serving, but I’m saving that for the second part of this meal which I will post in a few days. For now, respect that bone. I dig in with a spoon, and oh my, the wonderful amount of of fatty, soft, buttery, gelatinous, source of blood cells. A protein high! 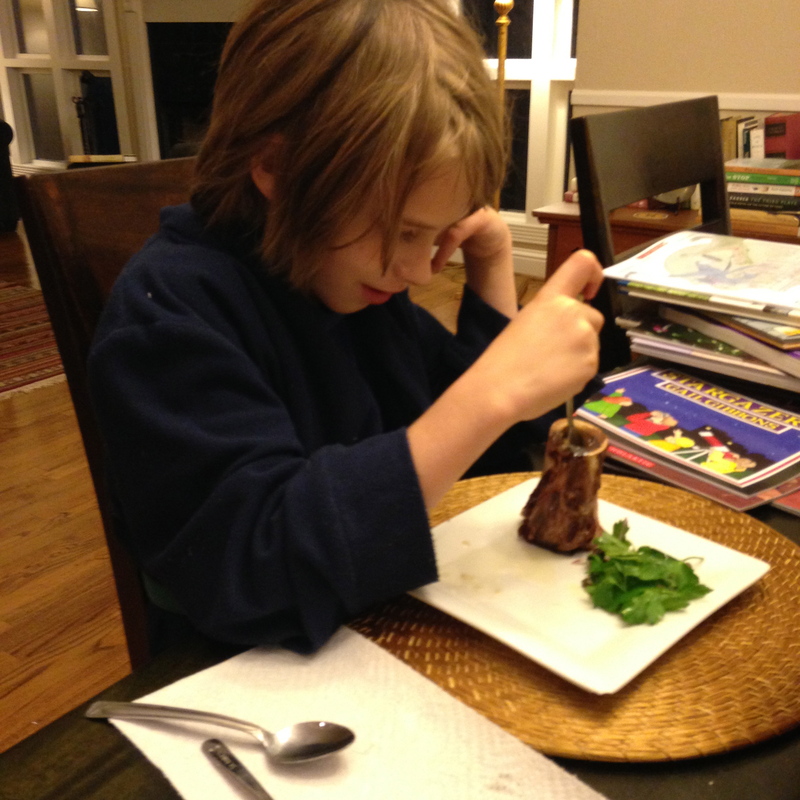 The boy studies his marrow, nodding to the animal and then digging in. Previous Previous post: The Philosophy of Polenta as I Whisk with Napoléon, Rousseau, Sebald and Aurelius. Next Next post: What Happens When A Dead Roman Cook Meets A Dead Gulf Coast Red Snapper? Let’s Find Out. Happy New Year!